A terrific presentation by Tony Seba, Instructor in Entrepreneurship, Disruption, and Clean Energy, on explanation for Why Current Energy & Transportation Will be Obsolete by 2030 should not be missed by any one interested in present and future trend! It was presented as the keynote at the Swebank Nordic Energy Summit in Oslo, Norway, on March 17th, 2016. It is based on the book “Clean Disruption of Energy and Transportation“, asserting that four technology categories will disrupt energy and transportation by: 1. Battery/Energy Storage 2. Electric Vehicles 3. Self-Driving Vehicles 4. Solar Energy. EV (electrical vehicles are more energy efficient and more powerful than internal combustion engine, better performance, and fewer moving parts (therefore less maintenance)). Ford and GM are becoming mobility services companies in addition to EV services. GM is also investing $half a billion into Lyft (Uber’s competitor) and just purchased $1 billion worth of self driving cars company. Foxconn and various computer companies are also getting into EV market. EV (electrical vehicle) companies such as Nissan and Tesla are offering limited free EV charging networks. SV (self driving vehicle) Startup Volta is offering free EV charging in exchange for media rights at prime high-value properties. Ultimately, one may power one’s house with one’s car and vise versa. EV’s and SV’s are essentially Computer on Wheels and Power Plant on Wheel !About half of the world’s population are ready to receive SV’s (self driving vehicles)! About half of Uber rides are carpooling in San Francisco area. Parking spaces will become more efficiently utilized as power plants. Solar energy has gone down in cost 200 times since 1970’s. 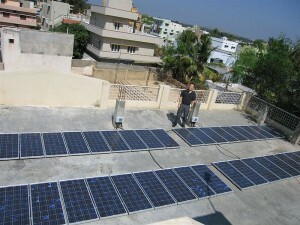 Solar installations has doubled every 2 years since 1990’s. It will take 7 more doublings or 14 years before Solar Energy would become 100% of world’s energy. Since 1970’s, Solar PV has improved cost by three thousand times relative to most conventional forms of energy and its cost will continue to go down. Solar energy on roof tops, when unsubsidized, is just as cheap as conventional energy, that is what’s called the Grid Parity (which has already been reached in 47 states in the USA in 2016) and up to 80% of the global market by the end of 2017 (according to Deutsche Bank). The adoption curve of any technology throughout history has taken the form of S curve and will likely be the same for solar technology adoption. The tipping point for Solar to reach its full adoption, commented by Tony Seba, is what he calls the Solar God Parity, the Point of No Return regardless where one is anywhere on planet earth, the cost of producing energy through solar rooftop is cheaper than the cost of transmission. Mr. Seba anticipates the Solar God Parity will be reached by 2020, the point of disruption or tipping point. Utility scale solar in USA and elsewhere on earth, unsubsidized, has dropped to 5 cents/kWh in 2015 in Nevada and in Saudi Arabia at 4.9 cents/kWh. (consider: oil at 5.8 cents/kWh is equivalent to $10 per barrel). 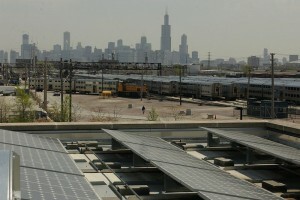 Cost of solar continues to drop. This is all happening right NOW! Can you believe it ?! In USA, we would only need 10,000 sq miles of solar to power the whole country, compared to U.S. oil and gas industry leasing 150,000 sq miles of land and water to pump oil and gas to produce one third of our energy needs. 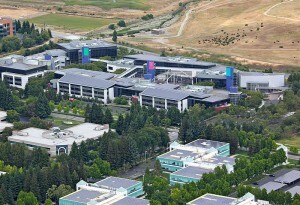 So, in USA, oil and gas industry is using 15 times as much area to generate one third as much energy produced by solar. In USA, we have up to 13,000 sq miles of parking space, so simply by placing solar canopies on all the parking spaces would generate more energy needs for the whole country for a year. Furthermore, converting just 10% of our parking lots to solar canopies would produce sufficient energy to power all of our electric vehicles in USA for a year. Yes, we’re looking forward to an exciting Clean Energy Future! It is important for policy makers to realize that they have the choice either to Lead or to Follow. If policy makers want to create jobs and wealth, it is necessary to lead rather than to follow. So, let’s vote for politicians who will lead and support clean and solar energy. 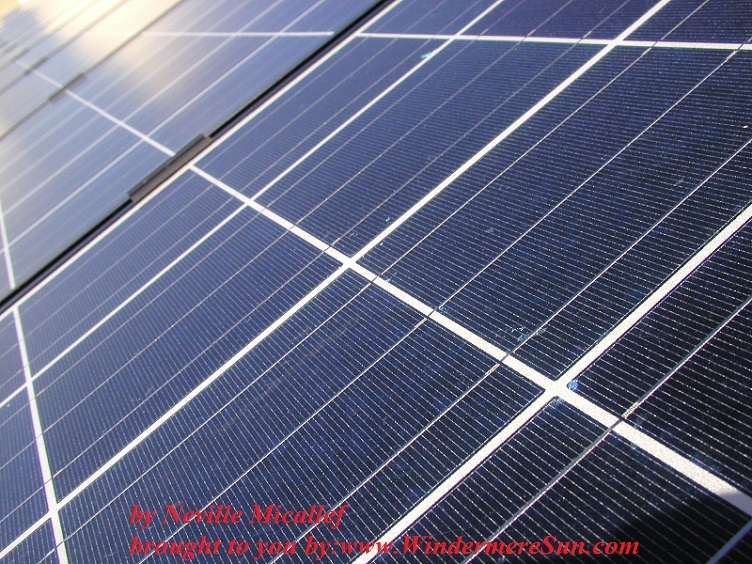 Here, in Windermere Sun, we look for ways to help our readers/viewers to be better prepared for the transition into our new Clean Energy Age. We will help you to find ways to reduce cost of living and develop new business models and formats in this Clean Energy Age through information and collaboration. Above, you’ve seen Dr. Erich Merkle introducing Grid Parity products at the Intersolar North America 2015. 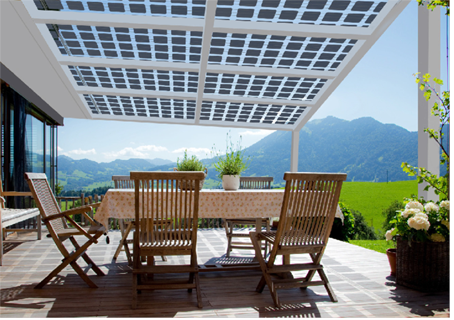 Grid Parity has developed system with the use of ultra-thin (5 mm) glass-glass bifacial modules especially for the applications of carports, patio roofs, or greenhouse roofs. These glass-glass modules are more aesthetically pleasing and with higher transparency than the conventional modules. The longevity and low maintenance are the factors that lead to extremely low levelized cost of energy ((LCOE) of this product. To find out more about this company and their products, click->GridParity. the universal aluminum frame system is used with a simple but extremely stable attachment method. Without the need to drill or weld, the installation can be carried out without any technical skills or special tools. The entire structure is made of anodized corrosion resistant aluminum. The connection parts are made of a special stainless steel with a high nickel content. 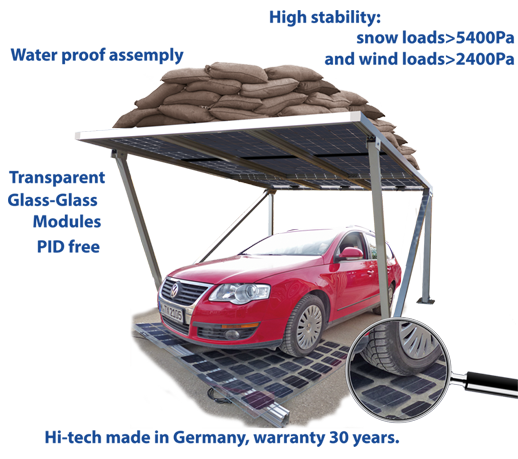 The number of necessary connections is optimized, with 25 screws for the small carports and 50 screws for the large carports. In the rooftop module for greenhouse/gardening or patio, such a module system may help to control the amount of sunlight coming through in addition to being able to help generate energy. (below, please click when you see red links). I came across this very informative clip of about an hour by Environmental and Energy Study Institute (EESI) and the Heinrich Boll Foundation. 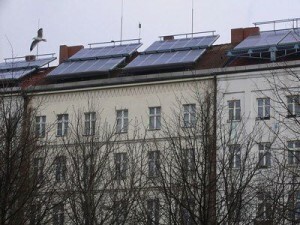 It took place during a Congressional briefing (March 12, 2012) which discussed the energy transition that occurred in Germany and how that compares, specifically with regard to the solar sector, to the United States. During this past decade, there had been tremendous growth and advances in opportunities, manufacturing efficiency, and deployment of this abundant renewable/solar resource from both sides of the Atlantic. If you do not have an hour to view this clip, please allow me to make the summary of this talk available to you, via http://www.eesi.org/solar-power-trends-german-and-us-perspectives-12-mar-2012 : Over the last ten years, Germany has increased the share of electricity from renewable sources from five to over 20 percent, while creating more than 380,000 new jobs in this sector. Not-so-sunny Germany is known as a world leader in deploying solar power. In 2011 alone, more than 7,500 MW of photovoltaics (PV) were installed in Germany, as compared to 855 MW in U.S. installations during the same time period, which set a record U.S. pace. Investments in Germany as well as the United States have spurred manufacturing and job growth. Government policy has been a determining factor in both countries. The speakers addressed these topics as well as issues faced in building a future grid that is flexible, smart, and strong enough for a renewable energy economy. Due to high cost of nuclear clean-up (4 billion Euro that will have to be paid by the tax payers), a near-Fukushima event in Germany, Fukushima incident, and wish of 90% of the German people, Germany currently has the goal of being completely weaned from the use of nuclear energy by 2022 and be able to achieve the use of 80% of power use from renewable sources by 2050. (Germany will be holding election next year. Its different political parties may have variation in its individual goals: Democratic Party aims for 75% in renewables by 2030 while Green party is aiming for 100% renewables by 2030). This past year, I’ve been spending a lot of my own time, energy, and effort in spreading the understanding of solar energy and effective Feed-In-Tariff. One frequent comment that I have heard, “Why should we follow the Germans?” There are two perspectives from which we may answer this question: it is for both ethical reason and selfish reason. It is our moral imperative to take part in transitioning into the renewable energy age (for a cleaner and safer environment/planet Earth). We simply have no choice, for fossil fuel is a finite resource. It is for our own economic benefit in terms of future job creations and economic growth that we should nurture the renewable and solar energy industry here in U.S. I understand that U.S. is a vast and diverse country, both its strength and weakness in terms of its ability in being able to change. It is time for us to put aside our differences and combine effort in asking our legislators and former Presidents to help President Obama in implementing the effective Feed-In-Tariff for Renewable Energy. Please visit http://sunisthefuture.net and sunisthefuture Youtube Channel http://www.youtube.com/user/sunisthefuture?feature=results_main for more on solar energy and Feed-In-Tariff for renewable energy and join us (Sunisthefuture Team at Kiva) at http://www.kiva.org/team/sunisthefuture to help entrepreneurs in U.S. and developing nations to establish/maintain businesses/projects in renewable energy/solar energy/recycling/energy efficiency via microfinance. For regardless who you are, if you are joining the Sunisthefuture Team at Kiva for the first time, you will be given free $25 to help another entrepreneur of your choosing in U.S. or a developing nation. This $25 will eventually be returned to help another entrepreneur (of your choosing). There is a time limit on these initial free $25 trials, so please act fast to get your free $25 trial. More details on this may be explained at http://www.kiva.org.